I recently completed a leasehold extension which involved issuing a Section 42 notice and applying to the Leasehold Valuation Tribunal. It was a long process but now that it is over I can share an account of what happened. 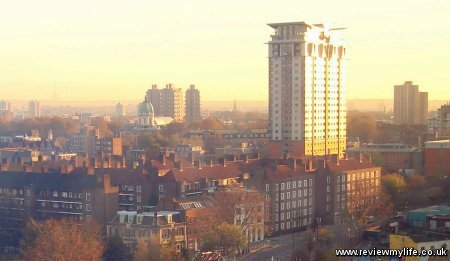 If you have bought a property in the UK there is a high chance that you have bought a leasehold. A leasehold is like a very long term rental. Instead of renting for 6 months you are renting for 10s or hundreds of years. The ultimate owner of the land or property is the freeholder. If you own the freehold, or a share of the freehold you will never have to worry about extending the lease (because you own the land/property, and are not leasing it). In this post I’m going to give real figures for the surveyor and solicitor costs for both sides, but I don’t want to reveal the actual property value or premium amount. I will however give re-scaled figures. I am going to use the diamond symbol ⋄ as my unit, and have re-scaled all the premium costs based on the property being worth 100,000 of this units at the time the process was started– so ⋄100,000. You can quickly turn the premium estimates and valuations into percentages of the property price by dividing by 1000. In order to extend a lease you will have to pay your own surveyor and solicitor costs, as well as your freeholder’s costs. If the lease is less than 80 years in length you will have to pay the freeholder 50% of the marriage value. The marriage value is the increase in property value as a result of extending the lease. You can come to an agreement without invoking the Section 42 process if both sides are happy with this. But in many cases both sides don’t agree, so the statuary Section 42 process will need to be invoked. Issuing a Section 42 notice to the freeholder will force him to give you valuation, and it mandates that the process and outcome follow a standardised set of rules. These include fixing the time scales by when each side has to respond, the terms of the new lease, and the right for the leaseholder to take the case to the Leaseholder Valuation Tribunal if no agreement can be reached. If the LVT stage is necessary then each side will be responsible for their own costs for this stage. I’d owned my property for about 8 years and had been aware of the lease length slowly ticking down. It had got down to about 67 years before I first did something about it. I sent an initial letter to the freeholder asking him for a rough figure as to what it might cost. He replied a week later saying that I would have to pay for his surveyor costs (£850+VAT) to get a proper valuation, but he guessed it might be around ⋄8600. This would not be for a 90 year statutary lease extension, this would be for a negotiated extension whereby the existing lease would be surrendered and a new 125 year would be granted. There are several problems with going down the negotiated route. The freeholder can give you any valuation he likes. Even though he guessed ⋄8600 in his letter he could well come back with a figure of ⋄15000 later on. By which time the £850+VAT valuation fee has been paid. And this valuation is not necessarily valid for the S42 process – you may have to pay the freeholder’s valuation costs again if you then decided to abandon the negotiated route and go down the S42 route. The negotiated lease could contain clauses that are unreasonable. It is likely you would have to agree to a rise in the ground rent. I did nothing more until the next year when one of the other residents in my building sent round a letter asking if anyone was interested in joining him in extending their leases in a group to save on surveyor / solicitor costs. This seemed like a good idea so I sent him my name. He had already contacted a surveyor and solicitor that he recommended we use. There were 4 people with 5 flats originally in the group, but one dropped out later. The core group was 3 people, with 4 flats between us. The first step would be the surveyor’s valuation which would cost £587.50 each. I had to give him a £100 deposit to commit. By the end of March we had all committed and his visit was scheduled for May. When he visited he looked at the existing lease and made some notes about it. Then he looked around the flat and took some measurements. After he’d been to all our flats we all had a drink together and he told us about the process and answered our questions. Two weeks later we received his valuation. He estimated the cost of a statutary lease extension at ⋄7500. He recommended we put in an offer at ⋄5800. And he predicted that the freeholder might try to seek a figure of around ⋄9300. Around the time the surveyor’s valuation was carried out I arranged for the solicitor to make an ordinary power of attorney (PoA) so a relative could act on my behalf whilst I was away in Japan. In June the solicitor was given the go-ahead to issue the Section 42, and in July the notice was served – it was signed by a relative using the PoA. Once the Section 42 is served the freeholder has two months to respond. And once the Section 42 has been served the freeholder can insist on 10% of your offer price being put on deposit with your own solicitor. As my offer was for ⋄5800 this meant I had to send a ⋄580 deposit. A month later in August the freeholder responded disputing the validity of the Section 42 notice as it had not been signed by me personally. I had to send over a new signed Section 42 notice from Japan which had to be re-served on the freeholder. This unfortunately resets the two month period. In October 2010 the counter notice was received from the freeholder. His valuation was ⋄11100, much higher that even the surveyor’s expectation of what the freeholder might ask for. Now that the counter notice had been received there were three options. Come to a agreed price by negotiation. Take the matter to the leasehold valuation tribunal. They can made the decision on the fair price for you. An application to the leasehold valuation tribunal (LVT) has to be made within 6 month of receiving the counter notice from the freeholder. That meant there was about 5 month of negotiating time left before we felt we needed to get the LVT application ready (best not to leave it to the very last minute!). Over a month later my surveyor managed to get a copy of the freeholder’s surveyor’s calculations. But the freeholder’s surveyor remained fairly elusive and non-responsive for the next 4 months. Although both surveyors occasionally communicated little common ground was found. Much of the disagreement seemed to centre on what percentage to use for the ‘relativity’ in their calculation. No offers or counter offers were made during this time. Occasionally I would email the surveyor for news, and after waiting 2-4 days he’d reply saying there wasn’t much to report. The surveyor estimated that if this went to tribunal his costs would be around £1500. And we would have to pay for our solicitor to attend the tribunal as well – the solicitor never gave an estimate of his costs for attending the LVT. It reached March 2011 and the 6 month deadline was looming so we asked the solicitor to make the LVT application. 10 days later the LVT acknowledged that the application was in their system. In April the LVT issued some written directions stating when the freeholder must send the draft lease for us to look at, and a suggestion that the hearing take place between June and August 2011. In May the solicitor contacted us to say that the terms of the draft lease had been agreed. This is referring to the wording of the lease, not the premium. That was still very much unresolved! At the end of May, to our surprise, we received an offer from the freeholder. He would agree to settle for ⋄9300. This was much lower than his original offer of ⋄11100, but still a lot higher than my surveyor’s estimate of the fair value being ⋄7500. In June the final premium of ⋄9300 was agreed. The agreement was signed by a relative using the PoA which had earlier on invalidated the initial S42. The money was transferred in July, and the final lease, and Land Registry documents were received at the end of August. Here is the timeline of events. 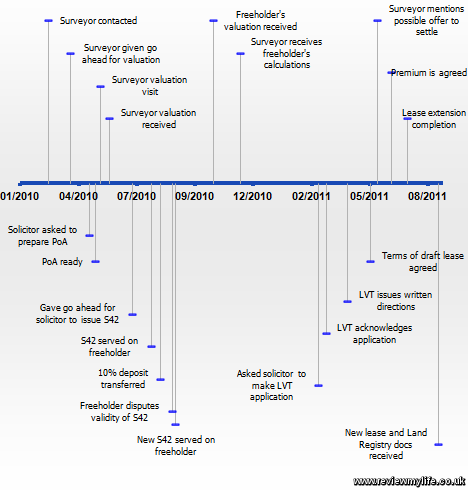 Here is the same timeline shown as a list. These prices include VAT. I haven’t included the £111.63 power of attorney, as this isn’t required in normal circumstances. I only had one arranged as I was going to be out of the country for a long time. 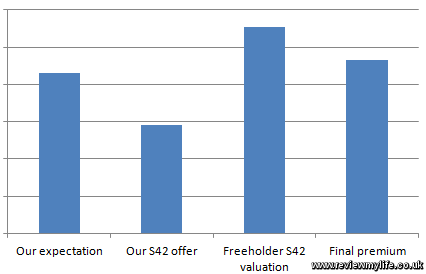 This graph shows how the estimate, valuation and final price varied. The whole process took about a year and a half to complete and used £4139.55 in costs (surveyor/solicitor). The premium was another ⋄9300 on top of this (or 9.3% of the current estimated value of the property). A lease extension is certainly an expensive and time consuming process. It isn’t too complicated if you leave everything up to your surveyor / solicitor, but it may be best avoiding it in the first place by not buying a property with a short lease.